Madrid, Feb. 14 -- The Infanta Maria de las Mercedes de Bourbon y Habsburg-Lorraine, Princess of Asturias , today became the wife of Prince Charles of Bourbon . The royal family, all the aristocratic world, and almost every high official of the kingdom were present in the chapel of the royal palace, where the ceremony took place. Shortly before the ceremony, there assembled in the private apartments of the Queen Regent Maria Cristina  those forming the bride's party, consisting of her mother, the Queen Regent; her brother, the boy King Alfonso XIII ; her sister, the Infanta Maria Teresa ; her aunts, the Infantas Isabella  and Eulalia ; her grandmother, Archduchess Elizabeth , with all the high retainers of the Court, ladies in waiting, grandees of Spain, and gentlemen in waiting. At the same time, there gathered in the apartments of the Infanta Isabella the persons composing the party of the bridegroom. 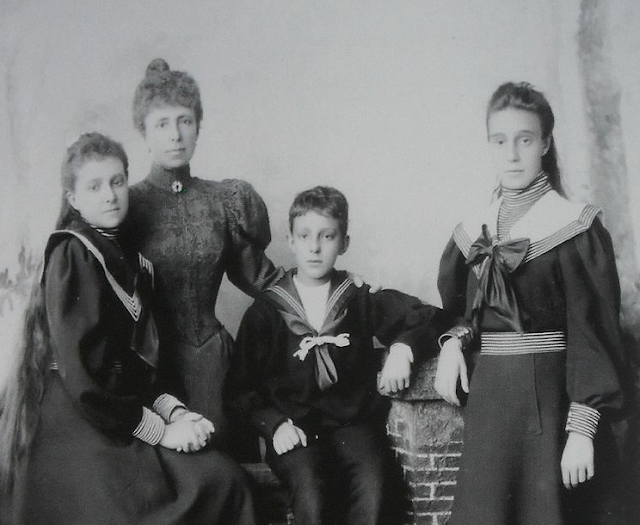 These were the parents of Prince Charles, the Count and Countess of Caserta ; the Duke and Duchess of Calabria ; his sisters, Dona Maria Immaculata , Dona Maria Pia , and Dona Maria Josephine ; and the train of ladies and gentlemen. The bridegroom's party emerged first and proceeded along the winding, massive granite corridors to the chapel, being immediately followed by the bride's cortege from the Queen Regent's apartments. Their places were respectively to the right and left, but in front of the altar, the bride and groom stopped at the steps leading to the altar and there kneeled, thus remaining throughout the mass, which was said by Cardinal Sancha, Archbishop of Toledo, Primate of Spain. Assisting him were Cardinal Casajeras, Archbishop of Vallodolid; Cardinal Herrera, Archbishop of Santiago de Compostela; and Cardinal Casana, Bishop of Barcelona. Low mass was celebrated, there being no singing, though solemn, sacred selections, including one written for the occasion by Zubicurre, were performed on the organ. As the bride and bridegroom knelt upon cushions touching the steps of the altar, a white, satin-bordered veil, three yards long and half a yard wide, was spread over the head and shoulders of the bride, reaching over the shoulders of the groom, but leaving his head uncovered, while, according to the Spanish custom, a white satin ribbon, called a yoke, was tied about the neck of the couple, the knot being made between them, signifying their union. After the mass, the simple Catholic ritual of marriage was read, the ceremony not differing in any detail from that uniting the most humble members of the faith, except that the ritual was read from a specially printed book in Spanish. Wedding rings were exchanged by both parties, these, of course, being of great value and unique workmanship. Another custom observed was that of giving coins to the bride by the bridegroom. These may be of copper or silver, or gold goins, according to the position and wealth of the contracting parties, but they must always number thirteen . Those employed today were thirteen gold coins, each weighing an ounce, and being of the coinage bearing the bust of Felipe, the first Spanish Bourbon monarch . They were the same used at the wedding of the grandmother of the bride . After the conclusion of the ceremony, the newly-wedded couple, arm in arm, arose and left the chapel, followed by a single cortege, the two family parties merging into one, instead of leaving separately, as they had entered. They traversed the long corridors to the apartments of the Queen Regent, where a record of the marriage was entered in a special civil register, the royal family and the same witnesses signing as signed the wedding contract on Tuesday. This ceremony ended, all repaired to the state dining room, in which the betrothal ball was held Monday evening, and partook of a wedding breakfast. Guests began arriving at the palace shortly after ten o'clock. They ascended the grand staircase and traversed the long corridor, lined on each side by halberdiers in red coats, white trousers, and black leggings, to the entrance of the chapel, where the Palace Guards, by thoroughly perfected plans, escorted each person to a proper seat. The Diplomatic Tribune was first filled. Among the early comers were Bellamy Storer, the United States Minister, and Mrs. Storer ; Stanton Sickles, the Secretary of the United States Legation ; Attaché Bowler; and M. Summers, the United States Vice Consul General at Barcelona . Each arrival, whether man or woman, added color to the spectacle, which, when the chapel finally filled, was a mass of wondrous coloring, due to the brilliancy of the dresses of the Court ladies and the elegant uniforms of officers and diplomatists. Just as the cathedral clock chimed eleven, the strains of the Brosci march pealed from the organ, while the bridegroom's party entered and took seats before the altar between the tribunes on either side. Prince Charles wore the simple uniform of a captain of artillery, but displayed also the Order of the Golden Fleece. The Duke of Calabria wore a similar uniform, covered with Spanish and Italian decorations. Prince Gennaro  was in the uniform of a cadet, and the Count of Caserta in ordinary evening dress. The Countess wore a cream-colored Court gown, and her three daughters' dresses were relieved with head and neckwear of white lace. After a moment's waiting, the more imposing cortege of the bride arrived. It was preceded by all the Court officials, who advanced amid an imposing sounding of trumpets. King Alfonso, dressed in the uniform of a cadet, with a small sword at his side, led the way. He walked erect and firmly, his healthy appearance giving denial to the rumors recently circulated that he was in poor health. Having kneeled at the altar, he turned to salute the diplomats. Then he kneeled again and bowed in the direction of his grandmother, who watched the ceremony from a private tribune in the Queen's chapel. Then came the Queen Regent and the other members of the royal family. 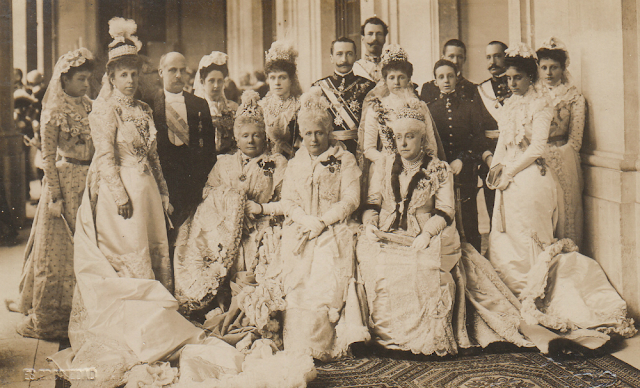 In the first row before the altar stood the Count of Caserta, Prince Charles, the Princess of Asturias, and the Queen Regent; in the second, the Countess of Caserta, the King, and Archduke Eugen ; in the third, the Duke and Duchess of Calabria and the Infantas; and in the fourth, Prince Gennaro and his sisters. The Queen Regent, in a robe of light cream, wore the crown. The Princess of Asturias was in white. The marriage ceremony lasted about half an hour. The Cardinal blessed the rings and coins and placed the coins in the bride's palms, and then the hands of the bridegroom above hers. He placed the rings in the hands of the bridegroom, who placed them in the hands of the bride, saying: "I give thee this guerdon in token of marriage." The bride replied, "I accept." The Cardinal wore ancient vestments, richly studded with gems and pearls, dating from the reign of Ferdinand. The Princess and now the Prince of Asturias will occupy apartments in the palace. It is not intended that they shall take a wedding journey at present. 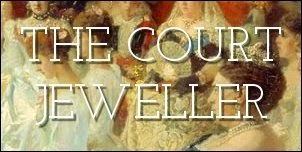 Tonight, the Count and Countess of Caserta and most of the wedding guests will leave the city. 1. Infanta Maria de las Mercedes of Spain, Princess of Asturias (1880-1904) was the elder daughter of King Alfonso XII of Spain and his Austrian-born second wife, Archduchess Maria Christina. She was named "Mercedes" in honor of her father's late first wife, Mercedes of Orleans. She was essentially the heiress presumptive to the Spanish throne for her entire life, first following her father and then her younger brother. She died only three years after her wedding following complications from the birth of her third child. 2. Prince Carlos of Bourbon-Two Sicilies (1870-1949) was the son of Prince Alfonso of Bourbon-Two Sicilies, Count of Caserta, and his first cousin, Princess Maria Antoinetta of Bourbon-Two Sicilies. Carlos's uncle, King Francesco II, was the last reigning King of the Two Sicilies. Carlos served in the Spanish army before marrying Mercedes; he was made an Infante of Spain in his own right a week before the wedding. After Mercedes's untimely death, Carlos remarried; one of his daughters from this second marriage was also named Mercedes. She later married the Count of Barcelona; they are the paternal grandparents of the current Spanish king, Felipe VI. 3. Queen Maria Cristina of Spain (1858-1929) was born Archduchess Maria Christina of Austria. She was the daughter of Archduke Karl Ferdinand of Austria and his first cousin, Archduchess Elizabeth Franziska. After marrying King Alfonso XII of Spain in 1879, she gave birth to two daughters; she was pregnant with a son when Alfonso died at the age of 27. 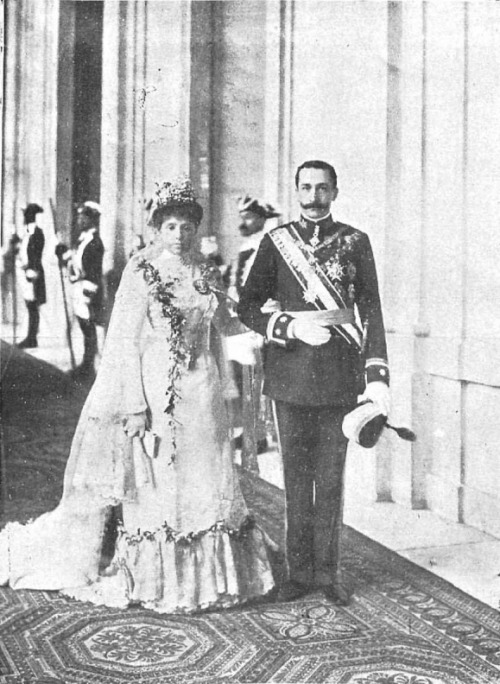 Her son was born a king -- Alfonso XIII -- and she served as regent for him until he came of age in 1902, the year after this wedding. 4. King Alfonso XIII of Spain (1886-1941) was the son of the late King Alfonso XII and his second wife, Maria Cristina. He was Spain's monarch from his birth, although his mother served as his regent until he turned 16. In 1906, he married Princess Ena of Battenberg, one of the granddaughters of Queen Victoria of the United Kingdom. In 1931, the royal family fled the country as Spaniards voted for predominately republican politicians; Alfonso formally abdicated the throne in 1941, six weeks before his death. 5. Infanta Maria Teresa of Spain (1882-1912) was the second daughter of King Alfonso XII and Queen Maria Cristina; she was the younger sister of the bride at this royal wedding. In 1906, she married her first cousin, Prince Ferdinand of Bavaria, who was the son of Infanta Maria de la Paz of Spain. Ferdinand was created a Spanish infante in his own right in 1905. The couple had four children; after Maria Teresa's death following complications from the birth of her last child, Ferdinand married a Spanish noblewoman, the Duchess of Talavera de la Reina. 6. Infanta Isabella of Spain (1851-1931), nicknamed "La Chata," was the sister of King Alfonso XII of Spain (and therefore the aunt of the bride). Like her niece, Mercedes, Isabella was given the title of "Princess of Asturias" at various points in her early life when she was the heiress presumptive of Spain. She married Prince Gaetano of Bourbon-Two Sicilies, a brother of the last King of the Two Sicilies (and therefore an uncle to the groom at this wedding) in 1868; he suffered from severe depression and committed suicide only three years later. She remained a central figure within the Spanish royal family and a popular princess in Spain throughout her life. You probably know her best as one of the owners of the Mellerio Shell Tiara. 7. 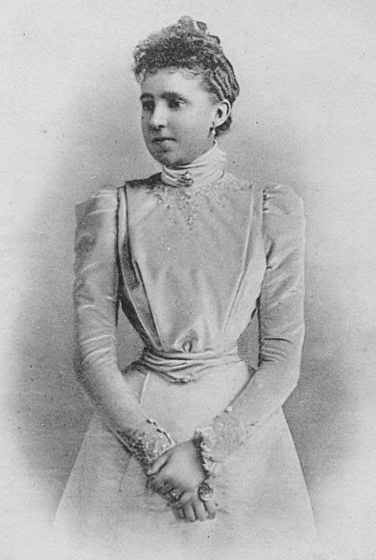 Infanta Eulalia of Spain (1864-1958) was also a sister of King Alfonso XII and an aunt of the bride. She married a cousin, Antonio of Orleans, in 1886; he was later granted the title of Duke of Galliera. Although they had two sons, their marriage wasn't a success, and the couple were legally separated in 1901, a few months after this wedding. Eulalia became best known as an author of controversial books that were frequently critical of politics in Spain and abroad; when her brother asked her not to publish one book, she staunchly refused. 8, Archduchess Elizabeth Franziska of Austria (1831-1903) was the daughter of Archduke Joseph of Austria, Palatine of Hungary (who was a son of Leopold II, Holy Roman Emperor) and his third wife, Duchess Maria Dorothea of Württemberg. By her first husband, Archduke Ferdinand Karl Viktor of Austria-Este, Elizabeth was the mother of Queen Maria Theresia of Bavaria; by her second husband, Archduke Karl Ferdinand of Austria, she was the mother of Queen Maria Cristina of Spain. 10. Prince Ferdinand Pius of Bourbon-Two Sicilies (1869-1960) and his wife, Princess Maria Ludwiga Theresia of Bavaria (1872-1954). The Calabria title was generally assigned to the heir of the throne of the Two Sicilies. Ferdinand Pius was the elder brother of the groom at this wedding. He was the last uncontested head of the House of Bourbon-Two Sicilies; after his death, the role was claimed by both his brother, Prince Ranieri, Duke of Castro, and his nephew, Infante Alfonso, Duke of Calabria. (Alfonso was the son of Carlos and Mercedes, the groom and bride at this royal wedding.) The headship of the house was finally resolved when representatives from both branches signed an act of reconciliation in January 2014. I'll direct you to Marlene Koenig's article on the event for more details. 11. Princess Maria Immaculata of Bourbon-Two Sicilies (1874-1947) was the sister of the groom. In 1906, she married Prince Johann Georg of Saxony, who was a dedicated art historian and collector. 12. This is likely Princess Maria di Grazia Pia of Bourbon-Two Sicilies (1878-1973), a sister of the groom. She wed Prince Luiz Maria of Orleans-Braganza, a member of the Brazilian royal family, in 1908. 13. Princess Maria Giuseppina of Bourbon-Two Sicilies (1880-1971) was a sister of the groom. 14. The coin ceremony is a tradition in Spain and other Spanish-speaking countries; the coins are called "las arras." The coins are also still a part of Spanish royal wedding ceremonies, including the wedding of King Felipe and Queen Letizia in 2004. At King Felipe and Queen Letizia's wedding in 2004, a collection of thirteen gold coins from various time periods was used. The oldest coin was minted in the reign of Ferdinand and Isabella; the newest dated from the reign of King Alfonso XIII. Cardinal Varela, the officiant, accidentally dropped some of the coins during the wedding ceremony. Oops! 15. King Felipe V of Spain (1683-1746) was the first Spanish monarch from the Bourbon dynasty. He reigned twice in Spain, first from 1700 to January 1724, and then again from September 1724 to 1746. 16. Queen Isabella II of Spain (1830-1904) was the bride's paternal grandmother. She was queen regnant of Spain from 1833-1868; after her abdication in 1870, she primarily resided in Paris. Her wedding to her double first cousin, Prince Francisco de Asis, took place in October 1846. 17. Bellamy Storer (1847-1922) was the Envoy Extraordinary and Minister Plenipotentiary to Spain from 1899 to 1902. His wife, Maria Longworth Nichols Storer (1849-1932), was the founder of Rookwood Pottery. 18. George Stanton Sickles (ca. 1872-1939) was an American diplomat; his parents were Daniel Edgar Sickles, a politician, Civil War general, and diplomat, and his second wife, Carmina Creagh, who had been a maid of honor to Queen Isabella II. Sickles's father was infamous for killing his first wife's alleged lover in Lafayette Square, across the street from the White House, in 1859. 19. Maddin Summers (1877-1918) was an American diplomat who served in Spain, Bolivia, Yugoslavia, and Brazil before transferring to Moscow. He died suddenly while serving in Russia in 1918; his death, which came in the midst of the turmoil following the Russian Revolution, was credited to the strain of his job. 20. Prince Gennaro of Bourbon-Two Sicilies (1882-1944) was a brother of the groom. 21. 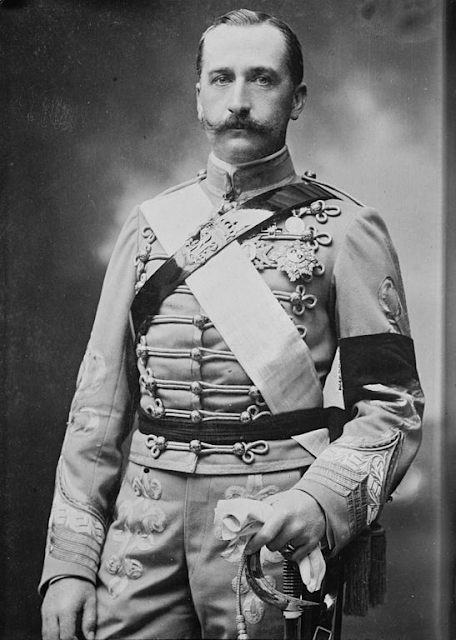 Archduke Eugen of Austria (1863-1954) was the bride's maternal uncle.